Summary: Last season, Orix posted a surprisingly competitive fifth-place, 69-71-4 season. ﻿I’ve written plenty about my admiration for Orix’s personnel moves, and nothing has happened this offseason to change my mind. Well, the new uniforms are underwhelming, but I’ll let that slide. On the mound, Orix has added four rotation candidates, while subtracting Yamamoto, who was ineffective in 2010. Each of the four new starters has blemishes: age (Park), health (Terahara), unproven-ness (Figaro, MacLane). But they all have upside as well, particularly Terahara, and if any one of them does well, Orix will have a very solid front rotation. At the plate, Orix’s most notable transaction is the loss of slugger Cabrera, who wanted a two-year deal and found one in Fukuoka. Despite his age (39), Cabrera remains an elite NPB slugger when he is in the lineup — he posted a Pacific League-best .997 OPS last year, but missed 32 games. The hope is obviously for some combination of at-bats from Lee and Hessman to make up for Cabrera’s contribution, but I have my doubts. Lee hasn’t had a good year since 2007 and is a shadow of his former self, and Hessman has great power but is also known for piling up strikeouts. I’ve been bullish on Hessman though, and I’m standing by that. Another key point to make is that last year the Buffaloes got breakthrough performances from Gotoh, T-Okada, Aarom Baldiris and to a lesser extent, Makoto Moriyama. Orix will need them to post strong follow up seasons in order to remain competitive. Overall I think Orix has done enough to take a step forward in 2011. The rub is that even if they do, the Pacific League is so balanced that they still might not make the playoffs. I’ve always meant to write about the culture of Japanese baseball, I figure two years in to blog I might as start. More importantly, Orix’s recent signing of Francisco Caraballo gives me an excuse to start one of my favorite things about Japanese baseball, the douage. Ideally, this is more of a late-season post than a mid-season post, but what the heck. The word douage (pronounced “doh-ah-gay”) doesn’t have an easy English translation. The most succinct translation I can come up with is something like “honoring an individual by tossing up and down in celebration”. The Japanese word itself, 胴上げ, comes from dou (胴), “torso” and age (上げ), “raise” or “lift”. 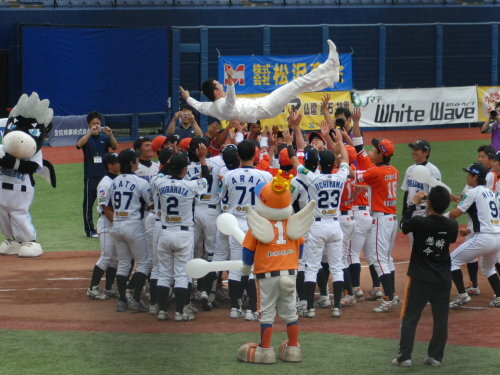 Every year, Japanese baseball teams douage their retiring players, and championship teams douage their managers after clinching a pennant, playoff series, or Nippon Series. But douages aren’t just for big wins and retirements. Caraballo’s BC League teammates and opponents sent him off with a douage. Keisuke Mizuta’s Seibu teammates did the same when he was traded to Hanshin last year (note, I didn’t actually watch the video in that link). And Deanna caught an on-field wedding on her trip to Niigata, in which the BC League players feted the groom with a douage. Looking at more typical douages, the most significant one of last year was for Katsuya Nomura, who retired as the manager of Rakuten after a life-long career in baseball. Both Rakuten and the opposing Nippon Ham Fighters took part in the celebration. Masaaki Mori’s 1987 Nippon Series douage is a famous one, but it’s mostly remembered for Kazuhiro Kiyohara breaking down and crying with one out left in the game. And finally, here’s one for my Brewers-blogging FanGraphs bud, Jack Moore: when Ken Macha retired from the Chunichi Dragons in 1985, he was presented with a bouquet and douage’d (farewell ceremony starts at 5:10), a real rarity for foreign players. Update on Penn: Pirates beat writer Dejan Kovacevic has tempered the Penn discussion a bit, saying that it’s only an inquiry so far. Here’s a more complete translation of what originally appeared in Sponichi: “Team representative Ishikawa has traveled to America and is in the midst of negotiations. It appears that an agreement is impending, with an official announcement to happen following a decision on the acquisition.” Originally that was one Japanese sentence but I busted it into two for readability. Just as I praise the Orix Buffaloes for a series of out-of-the-box moves, they go and make another, signing outfielder Francisco Caraballo out of the independent Baseball Challenge (BC) League. Caraballo hadn’t played higher than 2A ball in America, but moved to Indy ball in Japan last year where he lead the Island League in home runs (18) and RBI (76). This year he was hitting .364 with 15 HR and 46 RBI in 37 games for the Gunma Diamond Pegasus of the BC League. Thanks to the always-on Passer By for the tip on this one. Meanwhile, Chiba Lotte is closing in on an agreement to bring in Hayden Penn, who is currently playing for the Pirates’ 3A affiliate. Rotation depth is Lotte’s weakness, particularly with Yuki Karakawa on the shelf, and the Marines have a foreign roster spot to allocate, so another starter is a sensible acquisition.